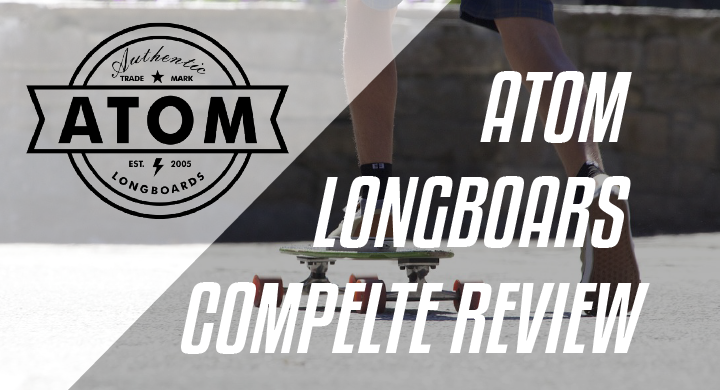 →Atom Longboards Review – Read Before Purchasing! Atom Longboards Review – Read Before Purchasing! Longboarding is a blanket term for the many styles of riding possible. It is a variety of niches, and each has manufacturers chomping at the bit to fill them, especially the affordable, entry-level niche. With so many companies battling in these trenches, it can be hard for one to build brand loyalty. This Atom Longboards review will examine whether that company has done it. Atom entered the longboard market in 2005, and has since gained a sizeable share of the entry-level niche. It has done it by providing considerable bang for its customers’ bucks, earning its reputation as one of the best longboard brands for beginners. Other companies persist making longboards that sucker new riders in with dreams of cheap price and high quality. Is Atom Longboards just another company making money off disappointed customers? We don’t think so, but we’ll let you decide. 2.1 Another Maple Deck Or N0t? 2.2 Decent Trucks for Beginners! 2.3 Not PRO Wheels, but Good for Cruising! 2.4 Bearings – An Easy Replace? Drop-through longboards lower the center of gravity for a stable ride. They are great for cruising and for mellow hills. Atom Drop Through longboards range in length from 36 to 41 inches, and each has eight plies of fairly flexible maple with wheel cutouts to prevent bite. The more-affordable Atom drop-through decks come with generic, reverse-kingpin aluminum trucks with 9.6-inch axles. They are decent-turning and solid compared to much of Atom’s competition, though they lack the feel of pro-quality trucks. The Area 51 wheels, common across the models, are 70mm tall with a 51mm contact patch and a 78a durometer. The AREA 51 formula is gummy. It provides excellent traction, but not the most speed. They will slide when forced, but traction is their thing. The Atom bearings are neither fast nor slow, though the higher-rated ones are quicker and smoother. Their ratings change inexplicably between the models, from ABEC-5 to ABEC-9, so read the fine print. Pintails are great for cruising and carving on city or suburban streets. Most have no tail or nose, so are ill-suited for pulling tricks. Atom’s Pintails are 39 inches long and 9.4 inches wide with full maple laminate. With generous concave compared to competing pintails, they keep feet locked in during fast carves. There are three graphics options from which to choose. Atom’s Pintail models have 8.5-inch aluminum trucks with traditional kingpin placement for livelier, sharper turns. These trucks are well-suited to their cruising and carving purposes on this setup, but are unsteady at faster speeds. Atom wheels on these pintails have a 65mm diameter and a 35mm contact patch with 78a durometer, and they have large, full-width cores. They ride rougher than typical cruiser wheels, but are fast and grippy. The ABEC-5 bearings are slow and fragile, and will require replacement sooner than the other components in this line. The drop deck — or drop down — shape is one freeriders tend to prefer. The lower center of gravity lends high-speed stability, and with less weight over the trucks, it is easier to kick into slides. The Atom Drop Deck (orange) is 41 inches long, 9.6 inches wide and has nine plies of maple, giving it a solid and slightly stiff feel. Its considerable drop and concave provide secure foot pockets for high-speed sliding, and its symmetrical shape works great for 180s and switch riding. These Atom trucks have 9.6-inch axles with 7-inch aluminum hangers. With 50-degree reverse kingpins, these trucks are stable at higher speeds but still turn well. The Atom Area 51 wheels have a 70mm diameter, a 51mm contact patch and a durometer of 78a. This is usually considered too soft for freeride, but the Area 51s have a denser formula that makes them slide well. The included ABEC-9 bearings are as good as gets for the product line. They are smoother than their lower-rated stable mates, and can achieve faster speeds. They may not compare with some of the better-known bearings on the market, but they are worth riding until they wear out. Kick Tail longboards are great for cruising city streets and serve well as transportation. The upturn — or kick — of the tail makes kick turns possible, opening up a new dimension to maneuvering. Atom has two distinct Kick Tails. The longer one is the “Green Surf” edition. It is 39 inches long and 9.4 inches wide, and has eight plies of maple with slight concave. It has 8.5-inch aluminum trucks with traditional kingpin placement. The Green Surf shares its shape and its 65mm, 78a wheels with the Atom Pintail. The Tiki is the shorter option. It has a retro cruiser shape, similar to an older 80s skateboard. The Tiki is 36 inches long, and it has small wheel wells to prevent bite. It shares its 8.5-inch aluminum trucks with the Green Surf, but its 78a wheels are of a gummier compound. Both models come with large, double-stacked riser pads that elevate the ride height, which can be reduced by removing one or both of the pads. They both have ABEC-5 bearings, which could stand upgrading. While either board will make a great cruiser, the Green Surf will provide a more surf-inspired ride, while the Tiki has more of an old school feel. Companies that aim for the entry-level rider can get away with things core companies cannot. Some push their advertising to the edge of credulity, suggesting a level of quality that simply is not often there. Atom makes no bones about its purpose, but says it intends to provide a mix of quality and value to its customers. So, how do its components stack up? Another Maple Deck Or N0t? Atom uses the industry-standard, maple, in its longboard decks. Of course all maples are not made equally, and the lack of literature on where Atom sources its wood from speaks volumes. Typically, this means companies are using Chinese maple. This is actually a normal compromise for a company like Atom, as Chinese maple costs much less than its American and Canadian competition. This tradeoff works in favor of the purchaser, as Atom passes the savings on to its customers. As this article in Transworld Skateboarding magazine shows, Chinese maple is softer and looser-grained than North American maple. Chinese manufacturing also cuts corners to produce comparable decks to American ones, as well. But, many companies after the beginner’s buck produce far worse decks than does Atom. Compared to its competition, Atom boards are solid and have a professional feel. Atom trucks vary in many of its longboard offerings, and some are more well-suited for their purpose than others. They are not poor quality, but they are not on the same level as professional trucks. High-end truck companies use precise machining to bring out geometrically sophisticated designs. Many develop cult-like followings from devoted customers that swear by their turning radius or solid feel at speed. Atom trucks are imprecise in comparison, but they are still quality components. Truthfully, most beginning riders would fail to notice the differences, and tighter turns or faster speeds are not what beginners need. A swap out is easy enough for more experienced riders, but for cruisers, it really isn’t necessary. Not PRO Wheels, but Good for Cruising! Atom loses serious ground to its more expensive competition when it comes to wheels. Atom’s urethane formulas seem simplistic compared to those from dedicated wheel companies. Durometer is an inconsistent way to judge the hardness of any wheel, but especially so with Atom wheels. For some purposes, though, Atom wheels are just right. The Area 51 wheels in its cruisers may feel harder than the 78a durometer suggests it will, but are fine for cruising. They lack the smoothness on rough terrain of a more purpose-mixed wheel, and may bite on cracks or pebbles. But, they roll smoothly, wear evenly and have excellent grip for cruising. Bearings – An Easy Replace? Atom bearings are the weakest link in its component chain, though the company shares this trait with many other manufacturers. Depending on the model, they may carry ABEC-5, ABEC-7 or ABEC-9 ratings, but these spinners do not compare to most aftermarket bearing options. This savings point doesn’t make sense. There is no way to know what these companies spend on their bearings, but it cannot be that much less than decent aftermarket ones. It would seem they could all upgrade and pass the expense onto the customer. Replacing these bearings brings Atom longboards to life, so the low-grade components are a mystery. In trying to be all things to all people, many companies find themselves spread thin and often miss the mark. Atom Longboards has a business model built on providing options and quality to its customers at a lower price point than high-end longboard companies can match. Likewise, it betters most its competition with well-made components that offer tangible benefits. No, these are not top-tier, artisan longboards, nor are they meant to be. The world is not black and white, and longboards are not either perfect or junk. Atom Longboards spotted a niche in the market and jumped to fill it, and a decade later it is still doing its thing. Affordable quality; who’d of thunk it?